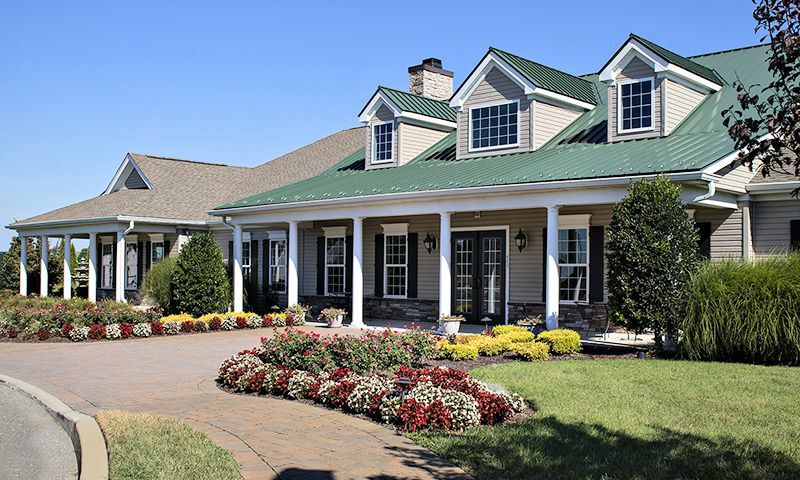 Champions’ Club is an active adult community just south of Dover, located in the enchanting town of Magnolia in the tax-friendly state of Delaware. This quaint community, although located in a small town, is only minutes away from The Dover Mall, a variety of restaurants, beaches and bay areas, and a variety of entertainment options. There are also several golf courses in the area, the closest one is Jonathan's Landing Golf Course, which is adjacent to the community. Upon completion, Champions’ Club will consist of 326 single-family homes, which offer convenient, maintenance-free main-floor living. The history and culture of Dover is just a short drive away, but with the on-site amenities amid the welcoming atmosphere of the historic town of Magnolia, residents may not feel a need to venture further. Low real estate taxes and quality-built homes are another great reason why active retirees choose to live in Champions’ Club. Although Champions’ Club is a smaller community, it offers plenty of community space for residents to stay in shape and socialize. The clubhouse includes a exercise room for healthy workouts and a card room where residents can get together for impromptu games or scheduled club activities. A conference room, kitchen and lounge provide lots of social space. Outdoors, residents can relax in the outdoor pool, or play tennis or bocce ball on the nicely maintained individual courts. Walking trails wind throughout the community where residents can go for strolls by themselves or meet up with friends and neighbors. When grandchildren come to visit, they are sure to enjoy the playground. Construction of Champions’ Club started in 2007 by The McKee Group and plans call for 326 homes when the community is completed. Homebuyers can choose from nine different floor plans that range from 1,224 to just under 2,000 square feet. Most homes have one to four bedrooms, two or three bathrooms, and an attached two-car garage. While most homes are available as new construction, there are a selection of previously owned homes as well. Residents of Champions’ Club enjoy resort-style living with low real estate taxes. There is something different to do every night of the week. In addition to the on-site amenities, nature lovers have plenty of areas to explore, golfers will find plenty of courses to play, and history buffs will enjoy living in this intimate community in the oldest state of the nation. Residents can also join existing clubs and interest groups and are encouraged to start new ones. Champions’ Club is located in Magnolia, Delaware. Magnolia has lots of historic charm and the best in lifestyle amenities, it's the perfect place to call home. Magnolia still has everything residents could need, from shops around the corner to hospitals and health care facilities. A broad range of community services are also available. Nearby, Wilmington and Brandywine Valley are certain to appeal to art lovers and antique enthusiasts. Nature lovers can explore beautiful state parks or stroll the pristine sandy beaches in the area. Metropolitan Dover is only twenty minutes away and offers many shopping, dining, and entertainment options. Some of the popular cultural attractions in Dover are the Johnson Victrola Museum, Delaware State House, Schwartz Center for the Arts, Rose Valley School Road Greenhouse, and Kent County Theater Guild. Champions’ Club is a great 55+ community from a trusted builder in the Dover area. Clubhouse - 6,900 Sq. Ft. There are plenty of activities available in Champions' Club. Here is a sample of some of the clubs, activities and classes offered here. There are four floor plans in the Americana Series that offer between 1,224 and 1,324 square feet of living space. These homes have one to three bedrooms, two bathrooms, and an attached two-car garage. The Savannah and Charleston models are no longer offered as new construction. The Classic Series includes five floor plans with 1,544 to 1,883 square feet of living space. The homes in the collection have two to four bedrooms, two or three bathrooms, and an attached two-car garage. The Callaway Grande is no longer offered as new construction. This little community is a great find. The houses are built really well, no skimping here. The staff at the community is great and the clubhouse is very nice. We've been pleasantly surprised. After less than stellar real estate experiences in the past we had high expectations which so far, have been exceeded with flying colors. 55places.com is not affiliated with the developer(s) or homeowners association of Champions' Club. The information you submit is distributed to a 55places.com Partner Agent, who is a licensed real estate agent. The information regarding Champions' Club has not been verified or approved by the developer or homeowners association. Please verify all information prior to purchasing. 55places.com is not responsible for any errors regarding the information displayed on this website.